The Punjab Assembly met for 193 working hours followed by Sindh Assembly, which met for 182 hours, the KP Assembly for 126 hours and Balochistan Assembly for just 95 hours. June 20; In a PILDAT assessment on the comparative performance of the four Provincial Assemblies of Pakistan in the third Parliamentary year (2015-2016), the Sindh Assembly has received the highest score at 68%, followed closely by the Punjab and KP Assemblies at 66%. Balochistan Assembly got the lowest score of 35%. The combined presence of Dr. Abdul Malik Baloch, Former Chief Minister of Balochistan (PB-48, Balochistan, NP) and Nawab Sanaullah Zehri, Current Chief Minister (PB-33, Balochistan, PML-N) was 59% of the total sittings in 2015-2016. A close second was the attendance of the Honourable Chief Minister of Sindh, Syed Qaim Ali Shah, MPA, (PS-29, Sindh, PPPP) at 51% of the total sittings in Sindh Assembly. The Honourable Chief Minister of Khyber Pakhtunkhwa, Mr. Pervaiz Khattak, MPA (PK-13, Khyber Pakhtunkhwa, PTI) attended 29% of the sittings of the KP Assembly in 3rd year. The lowest attendance in 2015-2016 was of the Honourable Chief Minister of the Punjab, Mr. Muhammad Shahbaz Sharif, MPA (PP-159, Punjab, PML-N), who only joined 5% sittings of the Provincial Assembly of the Punjab during the third year. While the Leader of the House in the Punjab Assembly demonstrated the lowest attendance, the Opposition Leader, Mian Mehmood ur Rashid, MPA (PP-151, Punjab, PTI) attended 85% of the sittings in 2015-2016, the highest figure for any leader of the opposition in the provincial assemblies. Khawaja Izharul Hassan, MPA (PS-99, Sindh, MQM), Opposition Leader from Sindh Assembly was present for 73% of sittings; Maulana Abdul Wasay, MPA (PB-20, Balochistan, JUI-F), Balochistan Assembly Opposition Leader attended 61% of sittings, and Maulana Lutf ur Rehman, MPA (PK-66, Khyber Pakhtunkhwa, JUI-F), KP Assembly Opposition Leader, was present for 53% of the sittings. Sindh Assembly also had the best performance with regards to legislation with a score of 70%. The Assembly saw an active membership that introduced the highest number of Private Members’ Bills at 9. Private Members’ Bills are important indicators of the performance as they reflect the usage of the provision given to legislators to make laws in addition to those made by the Executive. The remaining 3 Provincial Assemblies lagged behind with only 1 Private Members’ Bill introduced by the Punjab and KP Assemblies each. No Private Members’ Bill was introduced in the Balochistan Assembly in 2015-2016. Meanwhile, the Punjab Assembly passed 46 laws in its third year (2015-2016), the Sindh Assembly passed 28 bills, the Balochistan Assembly passed 23 bills while the KP Assembly passed the lowest number of bills at 18. The Provincial Assembly of the Punjab had the best performance with regards to the Oversight of the Executive in 2015-2016 with a score of 84%. Even though the budget process in Assemblies remains very weak in general, Punjab Assembly spent 13 sittings (42 hours) discussing the Provincial Budget 2015-2016. In comparison the Sindh Assembly’s budget session lasted 10 sittings (39 hours); Balochistan Assembly’s session lasted 6 sittings, and KP Assembly passed the annual budget in only 5 sittings. The Punjab Assembly is also to be commended for being one of the two Assemblies, alongside the Sindh Assembly, that has mandated in the Rules of Procedure a pre-budget debate to increase the powers of the legislators in the development of the annual budget. In terms of oversight of finances, however, the Sindh Assembly surpasses Punjab by being the only Assembly to review the implementation of the budget on a quarterly basis. The Executive in Sindh submits a Quarterly Report of the Budget to Sindh Assembly, which is then discussed by legislators. However, significant reforms are still required across the 4 Provincial legislatures to strengthen the Budget process before its passage. With limited time available to scrutinize the Provincial Budgets and no adequate powers with Standing Committees to undertake in-depth reviews of the Provincial Budgets, year after year, Budget Sessions see mere endorsements of the Executive’s budget by the Provincial Legislatures. 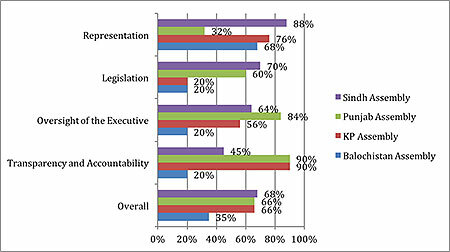 PILDAT has been making recommendations to strengthen the Budget process in the Parliament and Provincial Assemblies of Pakistan, which include increasing the duration of the Budget process to at least 30 – 45 days and changes in the Rules of Procedure of the Provincial Assemblies to allow Standing Committees both power and time to review the Budget both before and after its introduction. The Punjab Assembly met for the most number of sittings at 75 with the most amount of time spent in the House at 193 hours. In comparison, the Sindh Assembly met for a total of 182 hours over 59 sittings, and the KP Assembly met for 126 hours over 51 sittings. The worst in this regard was once again the Balochistan Assembly with 95 hours over the course of 46 sittings under its belt. In terms of time spent in the House, Sindh Assembly members spent 3.1 hours on average per sitting, followed by Punjab Assembly at 2.6 hours per sitting, KP Assembly at 2.5 hours per sitting, and lastly Balochistan Assembly at 2.1 hours per sitting. Standing Committees that offer the most important avenue of oversight of the executive and are considered the eyes and ears of each legislature show a dismal trend of activity across 4 Provincial Legislatures. 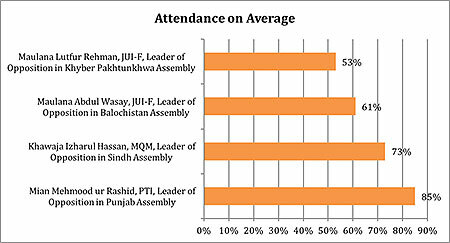 Even the highest number of average meetings per Standing Committee is 2.4, which is in the Sindh Assembly. In KP, Committees held an average 2.1 meetings per Standing Committee and 1.4 meetings per Standing Committee were held in the Punjab Assembly during the third year. PILDAT did not receive the requested data for the Balochistan Assembly in this regard. However, it is worth remembering that Balochistan Assembly lagged behind even in activating its Standing Committees while even at the close of the third year, 2 Standing Committees (Local Government, and Public Health Engineering) are still without Chairpersons and thereby not functional. There is a crucial need of reforms in enhancing the powers and capabilities of Standing Committees. In most legislatures, with the exception of the KP Assembly, Committees can only meet after a subject has been referred to them by the House and do not have suo moto powers, allowing Committees to take up any matter within their domain. The Punjab Assembly is to be commended for its amendment to the Rules of Procedure in 2015-2016 that makes it mandatory to hold election of Standing Committees within 90 days after the election of the Leader of the House. A similar rule needs to be introduced in the Rules of Procedure of all the Provincial Assemblies so that the inordinate delay can be avoided. Additionally, the Punjab Assembly also amended Rules adding a Zero Hour to take up matters of urgent public importance relating to the Government and requiring intervention of the Assembly. The Punjab and KP Assemblies surpassed the other Provincial legislatures in Transparency and Accountability with equal scores of 90%. Punjab’s most important initiative came with its practice of uploading the individual attendance of MPAs online on its official website. The Punjab Assembly became the first of all National and Provincial legislatures in Pakistan to make this move. 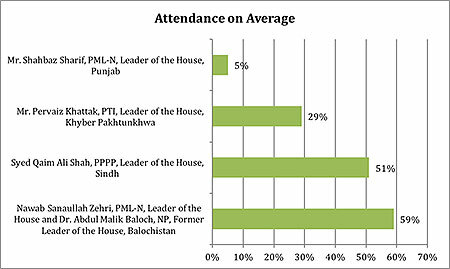 However, PILDAT notes with concern that the attendance of a number of MPAs is excluded from the uploaded attendance: including that of the Leader of the House, the Opposition Leader, Ministers, Parliamentary Secretaries, Advisor to the Chief Minister, and Special Assistants to the Chief Minister. All in all the attendance of 66 of the 368 MPAs is not uploaded. In comparison the Senate and the National Assembly upload the attendance of all the members regardless of whether they are Ministers or Parliamentary Secretaries. PILDAT recommends that the Assembly Secretariat upload the attendance of ALL MPAs as well as attendance within Committee meetings as is undertaken by the Senate of Pakistan. Regrettably, other than Punjab, no other Provincial Assembly has, as of yet, begun making available members’ attendance on their respective websites for easy public access. The Punjab and KP Assemblies regularly compile and update key performance statistics on their websites and are prompt in updating them. The KP Assembly uploads detailed business transacted by each of the 123 MPAs on the official website. The KP Assembly must also be commended for a landmark achievement to transact all business of the House on computers. Computers have now been installed on the desk of every MPA. All business being transacted from Executive goes through the Secretariat and is immediately accessible to MPAs who simply have to click on the relevant folders to immediately access information on questions, answers, motions, bills and proposed amendments amongst others. The quality of websites of the Balochistan and Sindh Assemblies lag far behind those of the Punjab and KP Assemblies. Not only do they not have detailed performance statistics but they also do not upload basic information such as lists of adjournment motions, Calling Attention Notices, questions, etc. Sindh Assembly is only marginally better than Balochistan Assembly by virtue of regularly issuing notices of Committee meetings. PILDAT has assessed the cost-efficiency of the Provincial Assemblies with regards to allocation of the budget. In 2015-2016, the KP Assembly was the most cost-efficient at spending Rs. 6.3 million for every working hour, Punjab Assembly spent approximately Rs. 6.8 million per working hour, Sindh Assembly spent about Rs. 8.1 million per hour, and Balochistan Assembly was least cost-efficient with Rs. 12.9 million per hour. PILDAT scored the performance of the four Provincial Assemblies in the third Parliamentary year (2015-2016) using a series of key performance indicators. Scores were generated using the min/max technique on the respective data for each Provincial Assembly and then aggregated to arrive at a final score out of 5. After each score out of 5 was generated, equal weightages were assigned to each parameter: Representation, Legislation, Oversight of the Executive, and Transparency and Accountability. Final weighted percentage scores were then calculated. For the parameter on Transparency and Accountability, scores were assigned subjectively by the PILDAT Team based on on-going monitoring of the websites and the sharing of crucial information.